The Self-Publishing Manual, more effectively and successfully than any other book, has turned writers with an idea into successful authors with books by providing solid, usable information in clear, concise, readable lanugage. This is not the stuff of theory, it is the product of hard-earned experience. The bible on self-publishing. Highly recommended by virtually everyone in the industry -- even other authors of books on the subject (many of whom probably followed the advice in Poynter's previous 11 editions). Worth 5x the cover price! If you tore this 450-page book into five sections, each section would be worth the full price. Dan Poynter has jammed useful advice into each and every page and covers everything from writing your book, creating the front and back cover, how to get it into bookstores, promote it, ship it. He also has links to more detailed articles published as PDF's on his website. Don't even think about writing and publishing your own book until you have read Dan Poynter's Self-Publishing Manual. With help like Dan's we can eliminate the term `starving writers'. If you are a writer you're obviously a reader which means you should spend some time reading his book because it will shorten your learning curve as well as fatten your wallet. Dan has added many a digit to my financial situation and I don't think I could have done it without him. Not in this decade anyway. Authors and publishers are so fortunate to have this type of information available today because it makes it easier for us to have success and enjoy the lives we are passionate about. Dan is The Self Publishing Guru and this is great! If you are planning to self-publish a book, this in the book you should read. Dan Poynter is the guru of self-publishing. The resources and lists in this book are tools a self-publsher simply can't do without. Poynter's advice is sage and extremely well thought out. His book will bring you from someone dreaming of publishing their own book, to a successfully self-published author. I am the author of 8 books [..]. From my very first release ten years ago to my latest, I followed Dan's sage advice on everything from production to marketing. I have also referred 3 friends who are self-published authors to this book, and they all found it to be an excellent resource. Glad to see there is an updated edition. I couldn't recommend this book more highly to anyone who is thinking of writing a book to authors who have already done so. Let's face it--there are now about a gazillion books out on self-publishing or variations of self-publishing such as subsidy presses (iuniverse, Xlibris) and they all say more or less the same thing. Some of the newer ones concentrate on promoting on the Internet. Dan Poynter is the granddaddy of all self-pub book authors--and I actually read one of his first ones. Back then he concentrated on things like what kind of bag you should use when sending a book by mail--bubble or Jiffy. He still goes in for details like that (which can be very, very useful when you get down to the nitty gritty details of self-publishing). But he also spends a lot of time handing out names and addresses of practically everybody associated with the business. Yes, there's lots of hype and promotion to buy the reports he puts out, but he's reaping the benefits of years of being the top s-p guru. The crazy thing is we are entering a new era of publishing--and everything will be upside down in a few years. But his sections on promotion and publicity are important. And for the neophyte who doesn't have the slightest idea of how to get an ISBN number or register a copyright this plain-talking manual is invaluable. There is a cheer-leading section (almost all books involving publishing or self-publishing have them) which is full of rah-rah stuff about how you can make lots of money in s-p. I've learned to skip that section just like I skipped the first chapters of James Michener's historical novels. You just have to cut to the chapters with the meat.But Dan also hosts a very helpful website (www.parapub.com) that includes lots of free info. This is THE classic "how to publish" book for a very good reason: it covers almost every area of publishing in at least modest detail. And it's full of very sensible advice and encouraging words. Don't be fooled by the "Self-" in the title. Traditionally published authors should read many parts of this. Anyone who is founding a publisher should, too. Some of the suggestions are appropriate only for the smallest publishers, and you may well grow past them. In other places, the techniques will work best for non-fiction, or for niche books. But even in those places, simply considering these ideas, and deciding which are adaptable for your book or company will improve your results. This is a great book, the problem is Dan has joined the likes of Dan Kennedy and Bill Glazier and many other info sellers. This book is really just a brochure for all the other products that Dan Poynter sells. 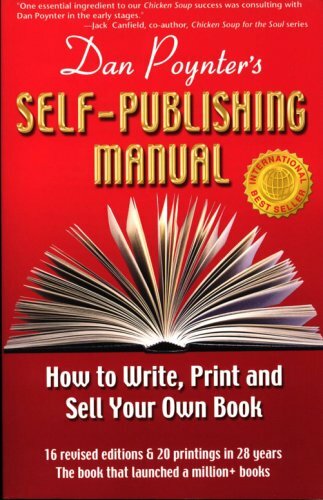 The Self Publishing Manual is a much needed how-to guide on how to write your own nonfiction books and then publish them yourself. The book covers more ground than most. It includes advice on layout and typesetting, size, cover design and copyrights. One thing that annoyed me was that much of the valuable information is referred to in the book but made available only as a paid-for download from the author's site. While some of this information - such as the list of current reviewers - needs to be timely and up-to-date, I felt that in some cases the book was being used as a "teaser". These days with the advent of companies like Booksurge (Amazon's PRQ - print required quantity - service) and Lightning Source, opening your own publishing business is within the reach of most people who can organise themselves and are good with software. However Dan Poynter's book concentrates in my opinion more on the logistics of small print runs (eg using offset) than on PRQ, and I would have thought that PRQ is the way forward for most people. I would have liked to see a section for instance on dealing with Lightning Source and Booksurge - and any other similar that I have missed out - along with the relevant advantages and disadvantages of each PRQ company. Dan Poynter's book is heaily biased towards nonfiction. This is logical because it reflects how he became a success as an author, but it rather leaves in the cold those of us who publish fiction. However even fiction publishers will find a lot of this book very useful. Overall I don't regret buying this book and together with "1001 Ways To Market Your Books" the two of them together solve most of the "how to" problems experienced by newbies to the industry. What Elvis was to rock n' roll, Dan Poynter is to self-publishing -- The King. His book contains what you need to know to self-publish your own book. This book is absolutely amazing! It gives so much information about getting started, I couldn't believe it! I would recommend this to anyone serious about self-publishing. There is even a list of places to send your book for reviewing. Buy this book! Dan Poynter deserves the highest remarks for his noble and courageous effort to guide thousands of desperate authors yearning for an opportunity to share their knowledge with the world. The $20.00 I spent on this book has been repaid back hundreds of times. I could not be more grateful for gaining the knowledge about book publishing in such concise book, with attractive format. The author approaches his reader as an educator with vast knowledge about the vast realm of the economy of printing and publishing. He strives to eliminate any illusion about the hurdles that face self publishers. Questions on the proper print color, best binding format, optimum book size and dimensions, preferred fonts and layouts, difference between copying others' work and copy right regulation, are addressed in great details. The book starts with a chapter that explains to the reader why self-publishing is the natural course of affairs for people who have the substance but lack the connections. The book then turns into the process of getting your ideas put in organized and documented fashion. It then explains on what to do with your organized material once you decided to put it in print. The book then discusses the processes of promoting, printing, listing, and selling your book. It delves into the fundamental details of each process. It familiarizes the potential author with the many facets of transmitting ideas through paper prints, from the author, the printer, the typesetter, the picking and packing, and the shipping phases of publishing. On the relationship between the self publisher and the local and federal governments, the book describes in details how the registration process evolves, what to do to get your book into the right hands for cataloguing and copy rights, and how to manage your own taxes as a seller. On the relationship between the self-publishing company and the vast world of book wholesalers, the book offers great details on how to approach those players and what to expect from doing so. Many of the wholesalers described in the book are up-to date in terms of addresses and contact information. The most useful section of the book is the book calendar. It has descending order of the steps needed to approach your book project, from it inception to its final appearance on the market place. Compared to other references I relied upon, this book has clear and organized calendar on each step of the process of bring a book to live. The drawback of the book is the recommendation of sending too many review copies to popular magazines, newspapers, and book reviewers. Most of those reviewers never proved useful or have any impact on the success or failure of my book. Most packages I sent for book reviews were a total waste of time and money. The best source of getting the book known was through Bowker's ISBN database, the Library of Congress, and the few top book sellers. The public is the best judge on how books rise or fall. Love it, need it, buy it! Dan Poynter's book is simply the best reference guide to publishing I've read. The book is easy to follow, full of meaningful tips and information, as well as resources. I hired my book cover designer from the book! BTW, Robert Aulicino! This is just an overall great book. I have read the book from cover to cover and reading it never fails to yield some tidbit of info that moves me forward in my marketing campaign for my book due to be released November 2007. Fantastic resource for every aspect of self-publishing and publicity. Dan Poynter "spills the beans" on the business and takes the terror out of putting it in print. Dan updated his book in 2007 just in time for me, before I published my first family history book. Dan pointed out some of the latest features on new digital technology, Print On Demand, recommended paper and covers, that helped me negotiate with several printers on better pricing using these features. I learned a lot about the book covers, editing and publishing, organizing your work, writing styles, marketing and distribution, pricing, copyright registration, ISBN registration, besides the technology end and much more. For the great informaiton that he shares, it's well worth the price! Dan Poynter's Self-Publishing Manual is an excellent book. It provides a solid foundation for the new self-publishing author. It is a bit long, but provides a wealth of good information. Buy it. If you plan on self-publishing or if you already have a self-published book available for sale, this is the book to read. If you are going to do something; do it right! If you read this book before self-publishing, your chances of success will increase dramatically. Poynter's SELF-PUBLISHING MANUAL can make the difference between a hero and a zero. If you are low on advertising funds, this book is right up your alley. The author shows his readers how to introduce their books to the civilized world without paying an arm and a leg for advertising. Author of "The Fraud of The Fraud"
For anyone serious about writing and publishing their own books, The Self-Publishing Manual is a MUST! Words can hardly describe how invaluable this book is. I referred to it time and time and time again. It's highlighted, sticky-noted, and dog-eared from its continual use. Poynter takes you from beginning to end on what it takes to create a successful book. Though it is particularly aimed at non-fiction writers, I was still able to apply it easily to my fiction title for children, Laura and the Leprechauns. I can't recommend this book highly enough. I would have been lost without it! The book is THE bible for writers who want to have control of their published work. Even if you don't self-publish, you gain an understanding of the writing, publishing, promoting and marketing process. Poynter's book is the best and most well structured book on self-publishing I have found. It helped me imensely for from an author-to-be to a soon-to-be- published author. 2. Poynter's "Self-Publishing Manual" is not about "self-publishing" in the sense the word is used today. It's about starting your own publishing company, your own small independent press. Today there are other options for self-publishing and these are not covered at all. I didn't return this book because it's interesting to read how the publishing industry works, and that understanding can inform an overall strategy. But this book alone does not give you what you need to know about self-publishing in 2009. I'm not sure why I haven't reviewed any of Dan's books before. I've heard him speak, I've met him and I have been receiving his newsletter for many years. I'm not a publisher, but I work with publishers and I employed two of Dan's free promotional techniques and have to say, they worked! I've gotten many new clients from doing something that took me only a few minutes and that people thanked me for doing. In fact, one of my all-time favorite clients informed me just last week that it was because of one of those little nuggets of wisdom, she found me. Dan Poynter's advice was by far the best promotional advice I've ever received.